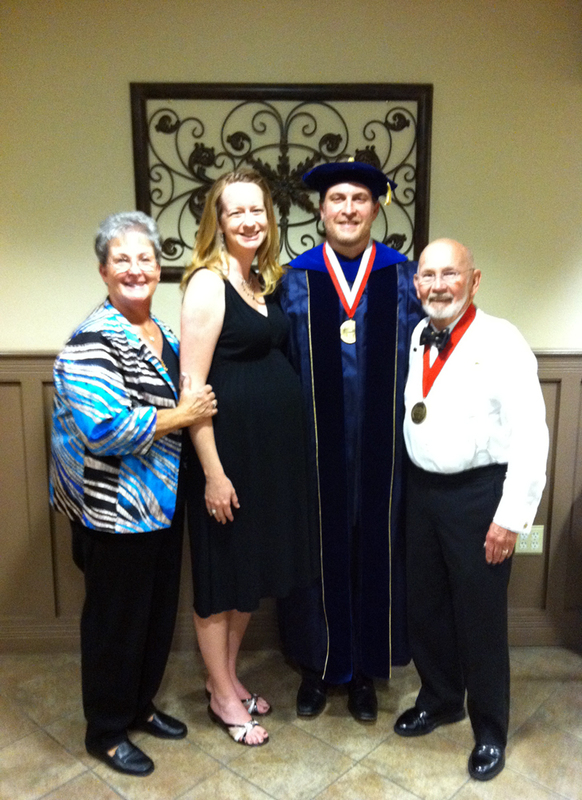 graduation | XKV8R: The Official Blog of Robert R. Cargill, Ph.D. 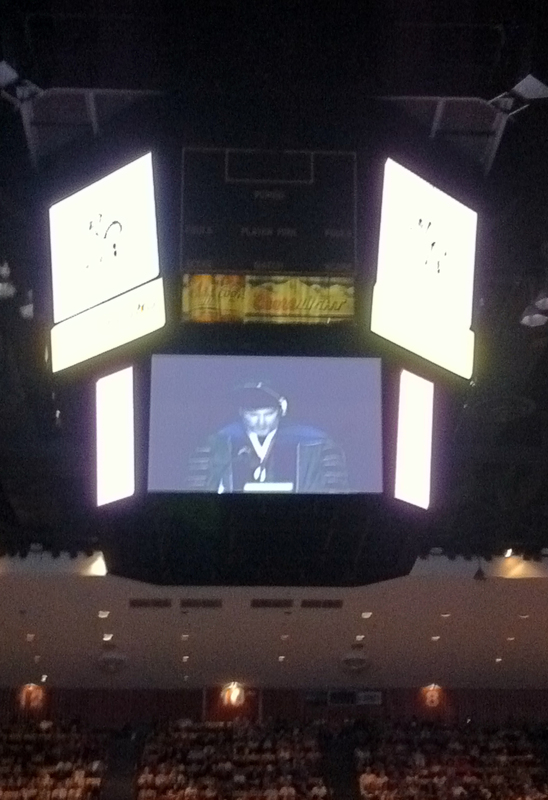 The following is the full text of my 2014 Commencement speech to the graduates of the University of Iowa (Twitter: @uiowa) College of Liberal Arts and Sciences (Twitter: @UIowaCLAS) at the 1:00pm ceremony on May 17, 2014 in Carver Hawkeye Arena. Preparing for my @uiowa graduation speech. I'll be live-tweeting the speech here at about 1:00pm Central. by Dr. Robert R. Cargill (@xkv8r), Asst. Prof. of @IowaClassics and Religious Studies @uiowa. #ChiliPepper?? graduates of the University of Iowa Class of 2014. I am honored to have been invited to give the faculty address, but I only have a few minutes to speak. And since most faculty speeches say the same thing, that is, “Congratulations”, “We’re proud of you”, “Good luck”, etc., I thought I’d use my time instead to give you something a bit more memorable. Not only is this graduation ceremony being streamed live, but because my speech has to be so short, and because I’m also a professor working in the digital humanities, I’m going to be live tweeting my speech as I speak. And I’ll be using the hashtag #UIGrad2014. And I’m going to start with some pictures, but I need your help. I need you to take some pictures with me. And then you can tweet your photos using the hashtag #UIGrad2014 while the other students’ names are being read. And you can re-tweet this speech and my photos available at my Twitter account: Robert Cargill, which is @XKV8R, that’s at X-K-V-8-R, as well. So listen to the speeches, and then re-tweet during the reading of the names. Got It? OK. Let’s start out with the ultimate “Class of 2014” graduation picture. Parents and friends up in the stands, you can play along too. We’ll all take pictures together. Ready? What’s that? No, I will not take a picture with your camera. OK, ready? 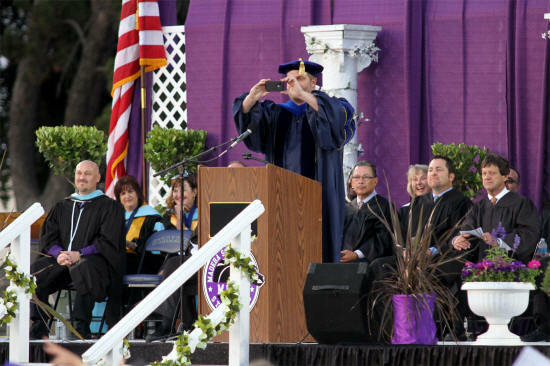 Please, please…do not flash the graduation speaker. OK, ready? One, two, three. OK. Now here’s a picture you can’t get. Here’s a picture of the platform party. OK, and now for the speech. Greetings University of Iowa “Class of 2014”. # Greatest Iowa Graduating Class EVER! Greetings @uiowa Class of 2014. #GreatestIowaGraduatingClassEVER! “College life was so good“. But I want to give you a quick heads up about what to expect from this day forward. Because you will also remember your time at the University of Iowa as one of the most transformative periods in your life. Because you will also remember your time at @uiowa as one of the most transformative periods in your life. Just ask the people sitting up here. But your personal transformation as a Hawkeye doesn’t end today. In fact, in many ways, life as a Hawkeye really begins today. And for some of you, that life will be spectacular. You will have tremendous success, you will be happy, and will make lots of money. # The Alumni Association will Definitely Be Calling You. And be proud! The University of Iowa has prepared you for that success. And BE PROUD! The @uiowa has prepared you for that success. But for some of you, life will be very difficult. You will face challenges. You will lose jobs. Relationships will be strained. Money will be tight. But believe it or not, the University of Iowa has prepared you for this as well. But believe it or not, the @uiowa has prepared you for this as well. and yes, deal with disappointments, and deadlines, and challenges. And part of being a member of the University of Iowa family means looking out for one another and helping each other out wherever life takes you. And part of being a member of the @uiowa family means looking out for one another and helping each other out wherever life takes you. Because you will meet Iowa alumni everywhere you go. I remember the day I was hired to teach here at Iowa. I was still living in California, and I had bought a University of Iowa sweatshirt when I had interviewed here for the job. I was still living in California, and I had bought a @uiowa sweatshirt when I had interviewed here for the job. And I didn’t KNOW the proper response yet! I had just been hired and I didn’t KNOW to say, “GO HAWKS”, back in response, or “ON IOWA”! So…I hesitated, and was caught off guard and said something like, “Uh…Soarin’ High”. so…I hesitated, and was caught off guard and said something like, “Uh…Soarin’ high”! By the way, # Cargill Did NOT Just Tell Iowa Graduating Class Of 2014 To “SOAR HIGH”. I just want to get that cleared up. By the way, #CargillDidNOTJustTellIowaGraduatingClassOf2014ToSOARHIGH. I just want to get that cleared up. But now I know what it means to be a Hawkeye. And I also know that your degree from the University of Iowa will prove to be one of the best investments you will have ever made. And I also know that your degree from the @uiowa will prove to be one of the best investments you will have ever made. In fact, you will never spend money that pays off as much as the money you spent going to the University of Iowa. In fact, you will never spend money that pays off as much as the money you spent going to the @uiowa. So be proud! You ARE the University of Iowa. And if you can handle six-month winters covered in snow, # The Planet Hoth, then you can handle anything! And if you can handle 6-month winters covered in snow, #ThePlanetHoth, then you can handle anything! First, say thank you to your parents or grandparents or whomever put your through college. And finally, find a student you don’t know, or never really talked to, and say, “Hi”, and give them a hug. # Guys, This Is Your Last Chance. # I’m Trying To Help. on behalf of the faculty of the University of Iowa, # Professional Nerds, CONGRATULATIONS on your graduation! On behalf of the faculty of the @uiowa #ProfessionalNerds, CONGRATULATIONS on your graduation! To Leah DeGrazia and Andrew Deloucas, and to all my students graduating today, I love you. Congratulations and good luck! And a member of the audience captured the second half of the speech. Thank you! For more images and tweets from the 2014 University of Iowa commencement ceremony, visit the hashtags #UIGrad2014 and #UIGrad14. I also want to acknowledge my inspiration behind this speech by thanking Ellen DeGeneres for her Oscar antics that inspired the Twitter pics of the graduates, to Stephen Colbert‘s “The Wørd” segments and Kevin Nealon‘s SNL “Mr. Subliminal” sketches for inspiring the idea behind the hashtag punchlines, and to Conan O’Brien for making graduation speeches fun. And many thanks to Cale Staley for his work behind the scenes. Thanks to all of you! Conan O’Brien really is an excellent speaker. He has proven this much with his most recent Dartmouth Commencement address. Beyond all the laughter, when Conan speaks seriously, it is sincere and incredibly meaningful.